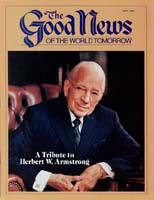 By ,now you all will have heard of the death of Herbert W. Armstrong on January 16, 1986. God's ways are higher than ours, and He sees what we are incapable of seeing. He knows our needs and He does take care of them, though not always in the way we might expect. I learned long ago, when my own father died in the faith, that although God does give us His faithful and unbreakable promise to heal, upon repentance and faith, He reserves the decision as to how and when . If indeed God does choose to allow the faithful to die, that death is not permanent, but only a temporary state of peaceful rest from the suffering of this present evil world, awaiting the redemption of our bodies into the glorious liberty of the sons of God! God mercifully granted us what Mr. Armstrong . considered several additional years of his leadership. God used him powerfully to get the Church to a dedicated, concerted unity carrying out the purpose of our calling, the proclaiming of Christ's Gospel of the soon-coming Kingdom of God, and feeding the flock that is the Body of Christ. I am personally, of course, deeply sobered and humbled by the responsibilities God has placed on my shoulders as Pastor General of the Worldwide Church of God. The apostle Paul stated that he was the "least of the apostles" (I Corinthians 15:9). In another passage he said he was "less than the least of all the saints" (Ephesians 3:8). Like Paul, I am also the least of the brethren. Yet I know, as Paul did, that "I can do all things through Christ who strengthens me" (Philippians 4:13). Jesus Himself set us the example. He did not speak on His own authority. He spoke the words and did the works of His Father, who dwelt in Him (John 14:10). He and His Father were ONE! They were (and are) in perfect unity. That same godly unity must be the binding of God's Church. Our Work is cut out for us. God has called us to unitedly and wholeheartedly carry on till Christ returns. We must make overcoming the priority. The time for this world's civilization is short. But there is much yet to do. As we submit to God, carefully and diligently seeking His will in our lives, and FORSAKING THE WAYS OF THIS WORLD, God will continue to bless His Work. He will lead us, direct us, guide us. But we must follow His lead together, as ONE BODY. Jesus is not fragmented and never will be. After Jesus was crucified and buried, several of the disciples decided to go fishing — back to their old trade. Maybe they thought the work was over. But what they didn't realize was that the greatest work was yet ahead! Pray as never before — for God's people, for one another, for the Work, and please pray for me. My prayers are with you. I deeply appreciate and love each one of you members and co-workers. Keep reading The Good News and The Plain Truth. They will continue to be what we believe are the finest magazines on earth. And keep growing spiritually. Will Christ find us doing His Work when He returns? I intend to be. And I'm calling on all of you to stand with me in Christ's service, holding fast to the great commissions He has given us, enduring patiently and faithfully to the end.